La Casa dei Ciliegi is a single modern building located a few steps from the center of the town of Santa Venerina. The apartment is independent and for the exclusive use of guests. The interior is subdivided into a kitchen, 2 double bedrooms, a bathroom with a shower and a bathroom with a bathtub. The house also has a large living room that we use as a third room in case of large groups. The environment is very quiet and comfortable and allows access to primary services such as restaurants, pharmacy, market, shops, bank, moving on foot. 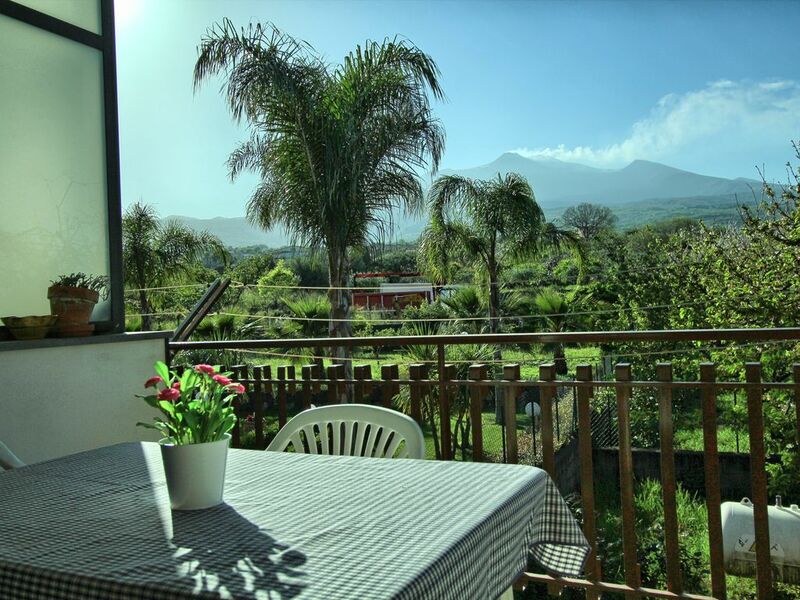 The house is adjacent to the road and has a large balcony with views of the coast and a terrace overlooking the large cherry garden with views of Mount Etna. Its strategic position makes it ideal for visiting the entire eastern coast of Sicily; you can move easily from Messina to Syracuse, passing through Etna and Catania. We offer free to our customers: parking, wi-fi, sheets and towels. The appartment was a little tricky to find initially with our satnav but once there was really comfortable. it has a great view of Etna it is located away from the hurly burly of Catania (which we knew) but is straightforward to travel from. For our stay we were plagued with wet weather and moved on mid-stay. However as a late season booking this struck us as an acceptable risk! Access to the coast and to Etna is easy. Fabio was considerate and helpful in sorting out things that needed attention while we were there. Très bon accueil.maison très confortable et très propre. Propriétaire très agréable. Esperienza sicuramente positiva, casa molto spaziosa e completa di tutto il necessario. ottima posizione per visitare sia Etna che tutta la costa. Casa accogliente, pulita, spaziosa. In una parola: ottima. Il figlio della proprietaria gentile e disponibile per ogni esigenza. Esperienza molto positiva. The Cherry House is proposed mainly as a good strategic base to move along the east coast of Sicily. From here, in fact, you can plan your excursions in the Natural Park of Etna pushing up to the craters of the volcano even passing through the "streets of Wine", a wine route between the charming and quaint towns around Etna wine producers. Santa Venerina and surrounding towns like Milo or Zafferana offer their visitors the smells and tastes of the typical products of a long tradition as one of the distillates, the Sicilian pastry, honey and citrus. Certainly do not lack the blue color of the sea to the beaches or the cliffs of Fondachello of ancient villages of the sea as Stazzo, Pozzillo, Santa Maria La Scala and Acitrezza where it seems as if time has stood still. But there is also culture and especially in this wonderful land that allows you to travel a long journey through the signs of ancient civilizations starting from Taormina and Giardini Naxos, Greek colonies, up to the baroque splendor of Acireale and Catania where art adorns the folklore of a great city.